Ray Bosse's 100th bird was a female Common Eider, and she was banded! Ray Bosse, dedicated SEANET foot soldier in Westport, MA where he walks Gooseberry Island and Cherry and Webb beaches, has turned up his 100th bird! Ray has been with SEANET just about the longest of any volunteer, estimating that he’s been Seanetting for about 5 years now. Lest ye doubt Ray’s dedication, check out the stats on the SEANET dashboard: he is number one for total walks reported, and at a breath-taking 288 walks, leaves the rest of us in the dust. Now that Ray has found his 100th bird, he joins a rarefied group indeed. Only Dennis Minsky has found more birds. Ray’s 100th bird was notable for another reason; the female eider sported a band, and Ray is now waiting for information about the bird having reported it to the appropriate authorities. Your SEANET blogger will share the details with you as they become available. The self-effacing Ray maintains that there must be some error in our accounting of dead birds, saying he can’t believe he’s actually found 100 given his relatively low carcass encounter rate. Indeed, our Buzzard’s Bay, Massachusetts volunteers do tend to find vastly fewer birds than, say, our Cape Cod volunteers, but Ray has been at this a good long time. Still, SEANET intends to look into Ray’s concern about our numbers, just to be sure all is in good order. We will be taking this opportunity not just to investigate Ray’s tally, but our entire database to make sure our data are accurate. The SEANET blogger will let you know the outcome either way. SEANET would like to thank Ray for being the model Seanetter (for instance, the SEANET blogger would like to point out the orange cable tie snugly fitted through this bird’s nostrils). Not only does Ray generate frequent reports from two beaches, the quality of his data is unimpeachable. He’s also been hustling around Westport trying to install a number of the monofilament recycling bins SEANET has provided, and he even drives a Prius! Ray Bosse, champion of the coastal environment and all around great guy, SEANET salutes you! Well, not much response to these mystery bones from Ray Bosse’s beach. Ray himself submitted the photos with the thought that they likely came from a seal, and the SEANET blogger concurs. 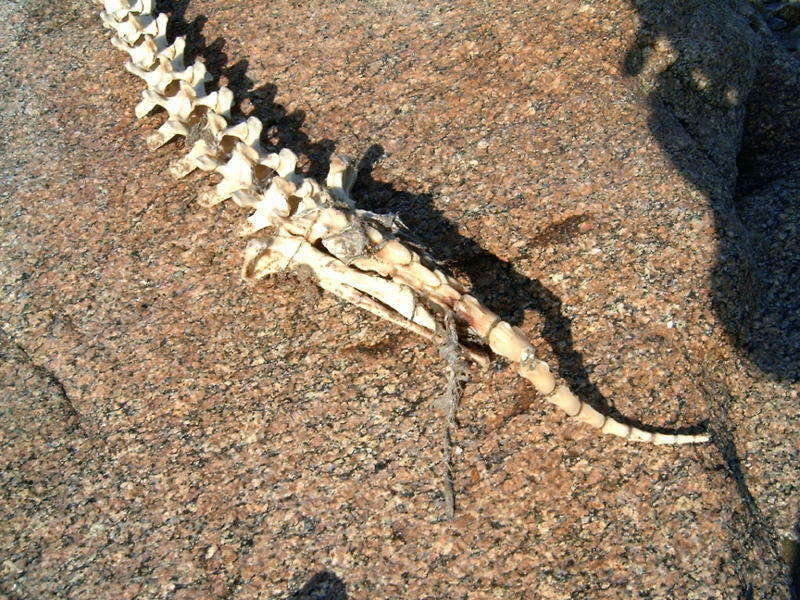 For sure, this is a mammal’s spinal column, and in the photo shown here, the head end of the spine is toward the left, and the tail end to the right. All the roughly rectangular to triangular bones at the right side represent the tail. Many of you will object, indignantly shouting, “But seals have short tails! No way this is a seal!” Your SEANET blogger would like to point out the less than svelte nature of seals, meaning that much of the skeletal structure of the seal’s tail is effectively buried underneath a good deal of blubber. In the photo, the seal’s rather slender pelvis is visible on either side of the spine. The pelvis does not particularly resemble a human pelvis, and this is a partial explanation for why seals look so absurd when they attempt to “walk” on land. In humans, or dogs, or giraffes, the hind limbs must have a system of complex and robust musculature in order to run and jump and kick, etc etc. All those muscles need a wide, large pelvis to which they can attach. As seals use their hind limbs only to flap back and forth while swimming, their pelvii can be much reduced in size and complexity. The extreme of this evolutionary process can be seen in whales, which, of course, lack hind limbs altogether, but retain a very small, vestigial pelvis. Seals are somewhat intermediate between terrestrial mammals and whales and dolphins. 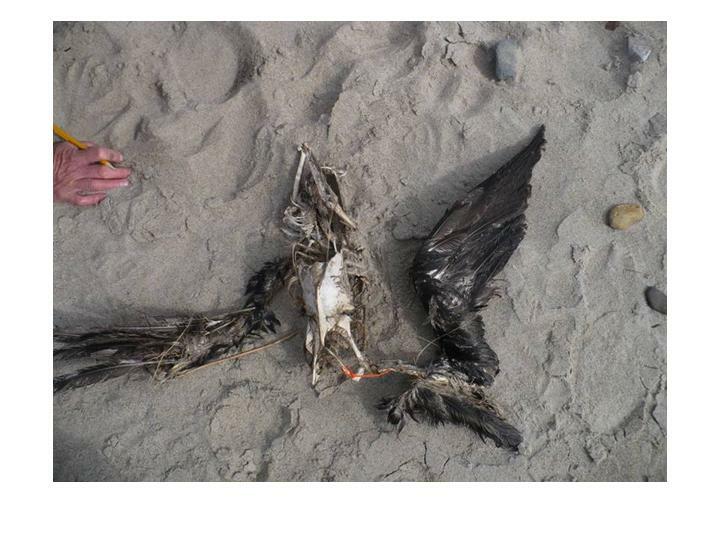 It occurs to the SEANET blogger that today’s post is a substantial departure from any seabird related news, but her affinity for dead things generally has overcome her today. Hopefully, you have enjoyed this brief lesson in the pelvic anatomy of various mammals. We will return to the usual seabird news next week. 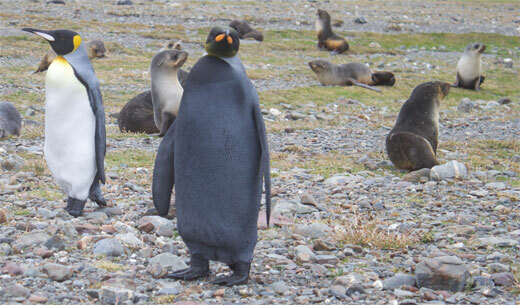 Submitted for your consideration this Tuesday, an extremely rare bird: an all black King Penguin on Antarctica’s South Georgia Island. Details of the report can be found at National Geographic’s Traveler site. The photo generated much bewilderment and consternation in the birding and scientific communities with heated debate and even charges of nefarious photo-shopping flying back and forth. Now there’s video of the celebrity bird strutting about, lending further credence to the report. Check it out and judge for yourself. 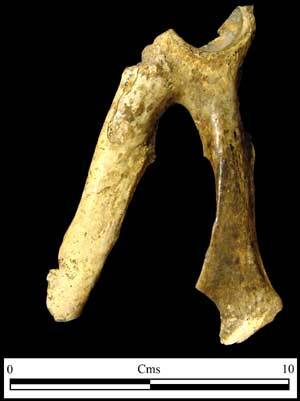 A four foot section of bones found by Ray Bosse in Massachusetts. What could it be? 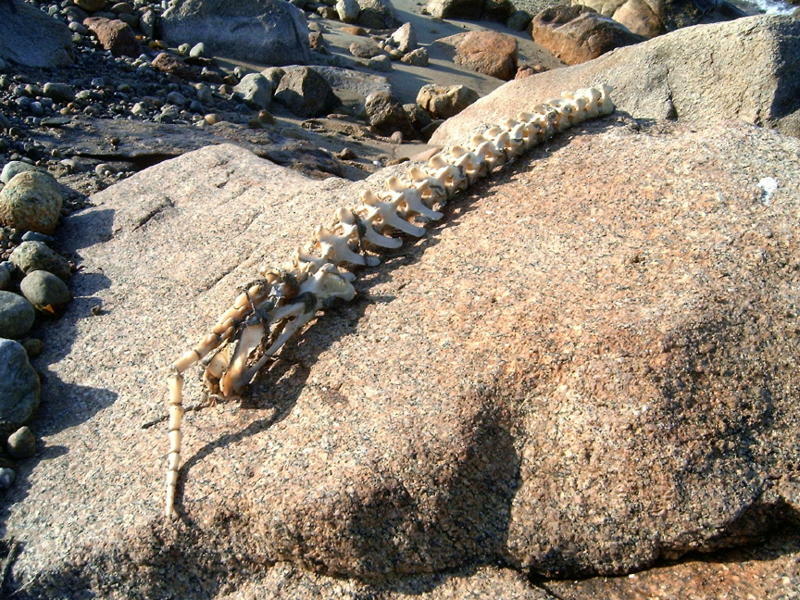 A bit closer to home, Seanetter Ray Bosse of Westport, MA spotted a string of bones on his beach. 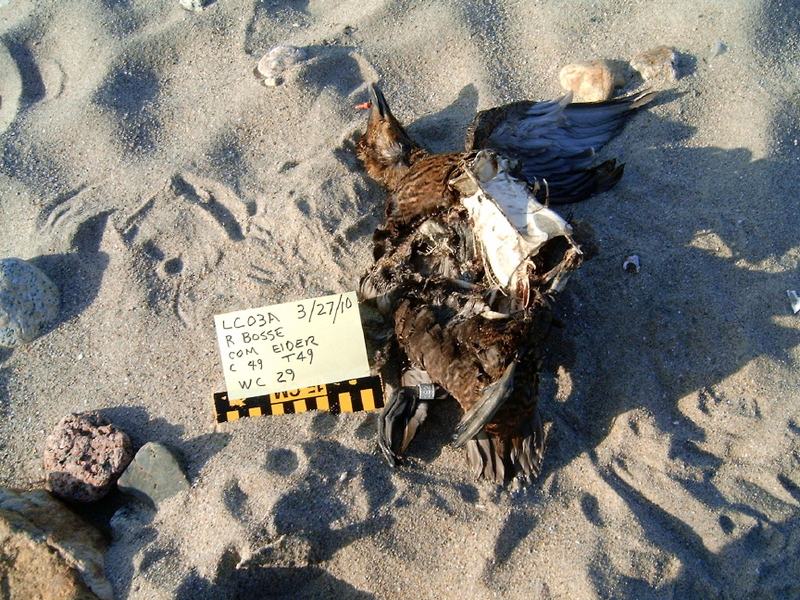 While noting that it is certainly not a seabird carcass, Ray made a moving plea for all dead things and asked that we not turn away from this specimen simply for its non-avian nature. The length of the specimen is about 4 feet. Any guesses as to the identity of the dearly departed owner of these bones? Just a pile of bones? Don’t despair! Sue Bickford of Maine found this shabby bone pile this month. Not uncommonly, Seanetters find not a complete carcass, but a rather degraded pile of feather and bone. Crucial parts like the head and feet are often missing, and a Seanetter would be forgiven for thinking that identification is all but impossible in such cases. Not so! In the case of the bird pictured here, all that remained were the sternum and wings. The sternum alone can give a surprising amount of information. In this photo the furcula (the two fused collarbones also known as the wishbone) is tagged with an orange cable tie (thank you, Sue!). 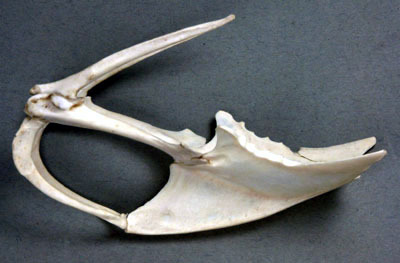 That furcula appears to connect to the keel, which is the sharp ridge of bone on the otherwise flat, shield-shaped sternum. That connection between furcula and keel is characteristic of pouchbills (pelicans and cormorants and the like). 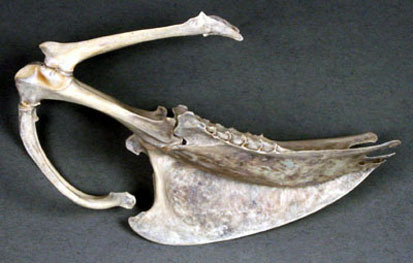 A cormorant's keel (the triangular ridge of bone) and furcula (the curving bones sweeping backward at left) are connected. The lesson here: if you find a jumble of bones, we may be able to tell what the bird once was if you take a few good pictures. Some guidelines: try to take your photos from directly above the bone and then directly through the side (angled photos can distort the anatomy). 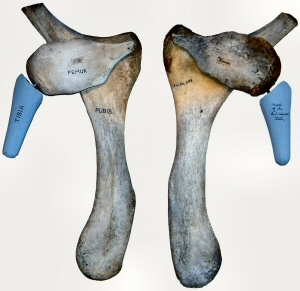 Your SEANET blogger does not pretend to expert knowledge of the subject, but can often give an idea of at least the species group to which your bony specimen might belong. For an excellent site on seabird bone anatomy, please visit Edward Soldaat’s seabird osteology page, from which the two photos of sternae shown here were borrowed. We welcome any and all bone photos, so don’t be shy about submitting them–they may be the key to the i.d.! Secretary of the Interior Ken Salazar has released the 2010 State of the Birds report, a joint effort of the U.S. Fish and Wildlife Service, Cornell Lab of Ornithology, Audubon, The Nature Conservancy, and others. The report examines the impact that climate change can be expected to have on avian species. While the analysis showed that climate change is predicted to disrupt birds in every habitat, seabirds and Hawaiian birds are projected to be the hardest hit (seems like this is always the case). Ken Rosenberg, who helped lead the report’s science team, says that the assessment indicates that many birds of conservation concern will face even greater challenges than they currently endure. Visit the site for details and a wealth of other information. While the text is generally discouraging, there are some very cool pictures of birds, so the experience is not entirely demoralizing. 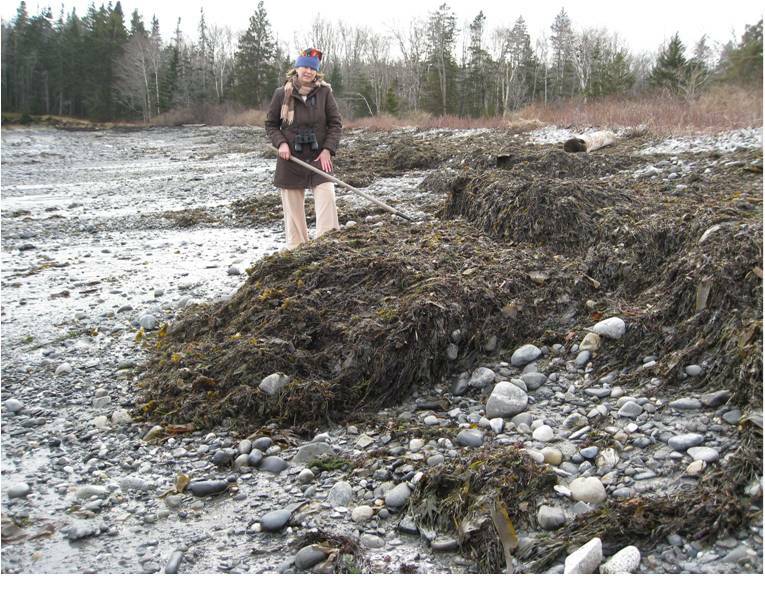 Aimee Moffitt-Mercer on Lucia Beach February 28, 2010 after a storm that left seaweed “bales” full of sand, fist sized stones and man made debris. We are very pleased at our burgeoning ranks of Maine Seanetters, and here’s another of our relatively new recruits: Aimee Moffitt-Mercer who walks (with son, Randy Mercer) on Lucia Beach in Birch Point State Park, Owl’s Head, Maine. The beach is a mostly sandy stretch popular with dogs and their walkers, swimmers (in season) and even guys driving little remote controlled buggies. 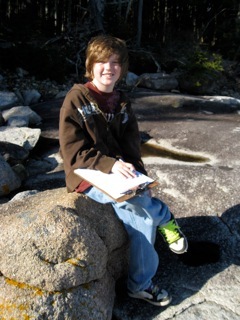 12 year old Randy Mercer on data-recording duty. “Aimee is 47 years of age and works half time as a Unitarian Universalist Church Administrator on Midcoast Maine. 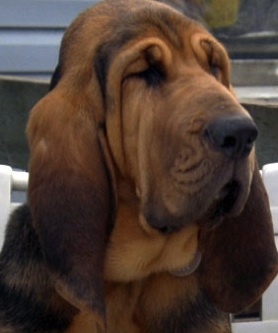 Aimee was born and grew up in Maine and has no intention to stray further than Maine. Not only that but she is landlubber; only enjoying flying vicariously through the birds she has gradually developed an affinity for over the past 25 years. The first bird that really captured her imagination was an indigo bunting (who wouldn’t be captivated huh) flying to and fro while she occupied a very small apartment in 1984 where there wasn’t much to do except enjoy the birds in the field. Since then she has lightly dabbled in birding, occasionally traveling short distances to surround herself, and be absorbed into, a flock of bird aficionados; wildlife biologists, and naturalists or attending programs sponsored by the local chapter of the Audubon society. Aimee has just begun to shuttle injured birds to Avian Haven, in Freedom, Maine. Avian Haven is a non-profit wild bird rehabilitation center dedicated to the return of injured and orphaned wild birds of all species to natural roles in the wild. Volunteering for the Citizen Science SEANET program is a great opportunity for her, as an ordinary citizen to give back and an opportunity to develop her sea bird vocabulary. Randy, her 12 year old son, is her good natured companion who through osmosis, and no fault of his own, possesses a flair for bird identification that may become ever more apparent as the years go by. 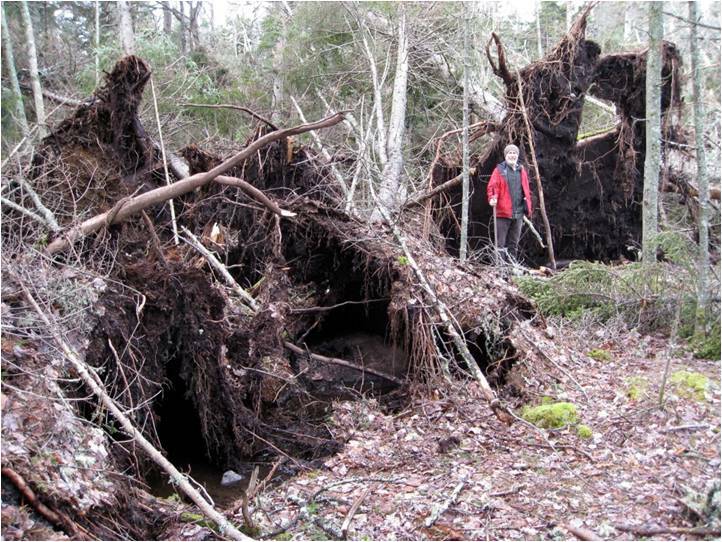 Lew McGregor amidst the post-storm wreckage last month. SEANET thanks all three of you for your enthusiasm and dedication–keep up the good work! There will soon be one more field to fill out when submitting SEANET data: we have discovered that having a dog along during walks can drastically increase a Seanetter’s likelihood of finding carcasses. This comes as no surprise, since, while human Seanetters are intrigued by dead birds, dogs love them so much that they will happily roll in one. In order to capture the influence a canine companion has on the carcass discovery rate, we need to know who is walking with a dog, and when. Ultimately this will be a simple checkbox in our online data entry form, but until we get that feature up and running, please indicate if you had a dog with you by noting it in the “comments” field when you enter your data. As always, thank you Seanetters!